I overheard my parents talking the other day…they were wondering what they’re going to do when I leave home for good. Food-wise that is! I’m sure they’d love to have their house back; it would be clean, tidy and quiet. But they can’t deny one thing – they eat much better when I’m around! We’ve nicknamed Mum’s cooking cordon bleu because it couldn’t be further from the truth! She’s well aware that she only has a few recipes in her repertoire that don’t involve packets of frozen food but having said that what she can cook isn’t half bad. When she’s not cooking fish fingers it’s probably a Chicken Supreme or a Bolognase! Dad’s a much better cook and he’s probably where I get my cooking skills from. Every now and then he’ll decide to cook a Chinese feast from scratch, or whip up a curry. He’s also not half bad at puddings! It’s just a shame he’s not in the kitchen more often when I’m not around. I don’t think my Mum is half as bad as we make her out to be. I think a lot of being a good cook is about having the confidence to try new things and the imagination to create something different when faced with the same old ingredients in the cupboard. A couple of weeks ago I cooked a sausage and asparagus risotto for the first time. It was completely unplanned and was based on what I could find in the fridge, but it worked so well we’ve tried it a few times and it now has pride of place on my blog. This recipe isn’t too dissimilar. 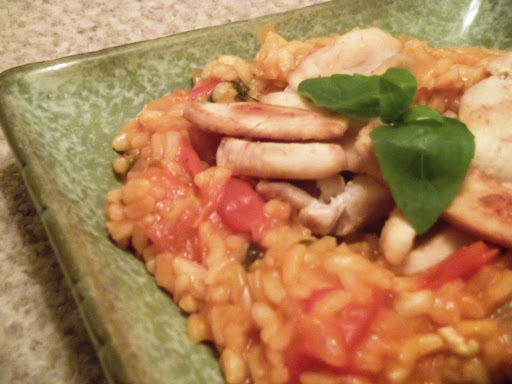 Not only is it a risotto recipe, but it uses up all of those ingredients you usually have lurking at the back of the fridge; chicken breasts, tomatoes, stock, tomato puree and rice. Nothing here – bar the basil if you don’t grow your own – is special or fancy, they are every day flavours that when combined together make something really quite special! This recipe also doesn’t have to be too unhealthy. Grill the chicken breast and replace the olive oil with one cal spray to make the dish extra lean. If you are cooking for vegetarians, replace the chicken stock for vegetable and pass up the chicken! The tomatoes really are the star so you won’t be missing out. And, believe it or not, it won’t do your purse any damage either! There really is no excuse not to give this recipe a go. Heat the oil in a large pan and fry off the chicken. When beginning to brown, transfer the chicken to a smaller pan leaving the juices and oil behind. In the large pan, fry off the onion and crushed garlic in the chicken juices. When they have become translucent add the rice. Let this cook for 5 mins until the rice has soaked up the juices. Next begin adding the stock a ladle at a time. Keep the heat of the pan low-medium and stir frequently. In between each ladle-full allow the rice to soak up the stock. Once all of the stock has been added (but not yet absorbed) add the tomatoes, tomato puree spinach and some of the basil chopped finely (keep some back for garnish). 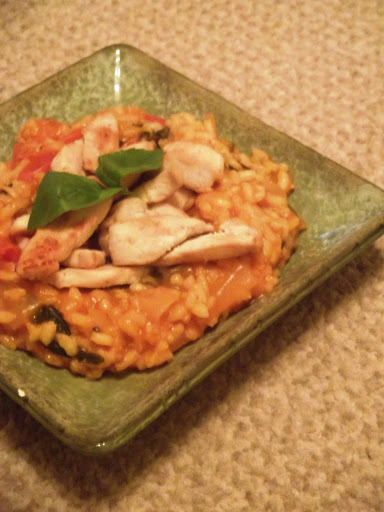 Allow the risotto to simmer gently until the tomatoes have begun to break down, the spinach has wilted and the risotto is creamy and soft. 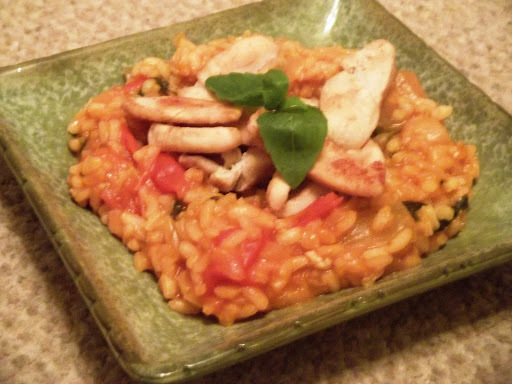 Serve the chicken on top of a bed of risotto with a few basil leaves on top!